NuGet is a powerful ecosystem of tools and services. It was introduced in 2010 as an open source package manager for the Microsoft development platform including .NET. NuGet is the easiest way to improve and automate your development practices. When you install a package via NuGet, it copies the library files to your solution and automatically updates your project. That means adding references, changing config files, replacing old version script files, etc. Nuget has been included by default since Visual Studio 2012, and for more information on how to get going with it, read the official Nuget documentation. If you have the NuGet packages stored on your machine in some directory adding a package source that points to that directory is very easy. 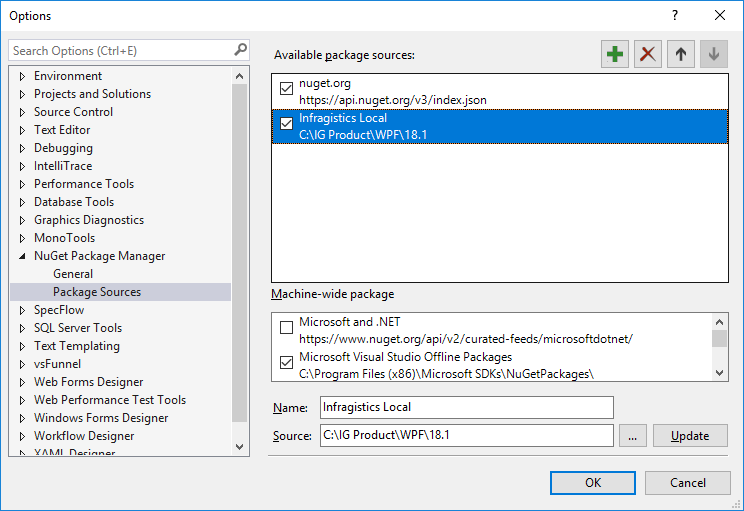 In Visual Studio, select Tools → NuGet Package Manager → Package Manager Settings. Next, add a new package source in the Package Sources menu. Make sure to set the Source field to the location of the directory where your packages are kept. That’s it! The packages are now ready for use. 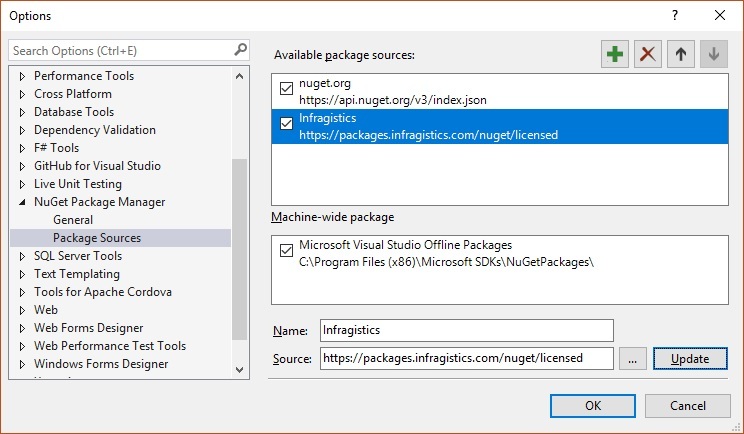 Infragistics provides a public NuGet feed for licensed users to consume and add licensed Infragistics Ultimate UI control packages to their applications via the NuGet Package Manager. In order to use the feed it needs to be added to NuGet Package Manager as a package source. 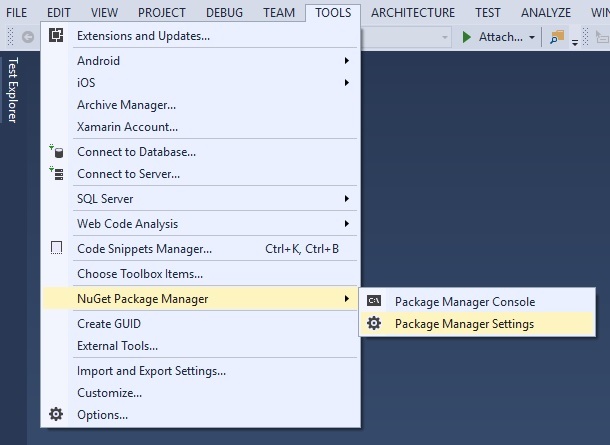 Navigate to Tools → NuGet Package Manager → Package Manager Settings. In the Package Sources section, add a new package source. 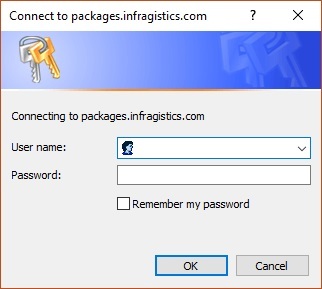 In the Name field, provide a name such as "Infragistics" and in the Source field provide the address of the Infragistics NuGet feed (URL: https://packages.infragistics.com/nuget/licensed) and click the Update button. The Infragistics NuGet feed is now ready to use. Now that your package sources are setup it is time to add them to your project. 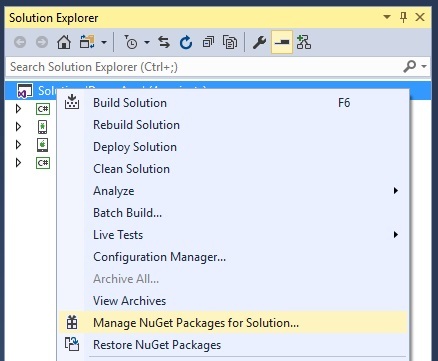 Open the solution’s NuGet package manager. Select the Infragistics NuGet feed as a package source. Search for an Infragistics control package. Select the package when found. Select which projects in your solution will have the package installed. Select the package version and click Install.